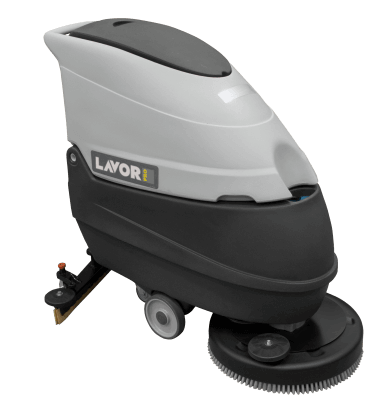 Very compact scrubbing machines suitable to work for the maintenance cleaning of limited-size areas (up to 1,500 m²). The outflow of the detergent solution is controlled by a solenoid valve. The actuation of the solenoid valve is operated by the control lever, avoiding the outflow detergent solution when the brush is stopped during the interruptions of work. Renovated with new squeegee pressure adjusting system. The squeegee blades are easily replaceable without the use of tools. Quick and easy coupling squeegee through the two large knobs; the squeegee is released without any damage in the event of accidental impact. Filter Mesh to retain possible solid pieces, protects the solenoid valve.